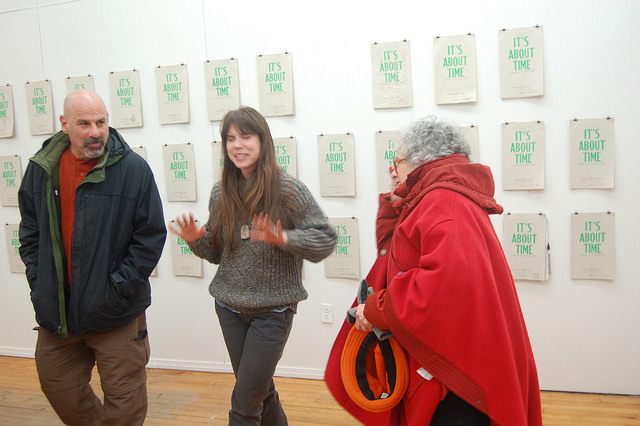 Last Sunday night provided a cold, snowy backdrop for our opening reception for the Impractical Labor in Service of the Speculative Arts (ILSSA) exhibit, “It’s About Time”. A few came out to defy Old Man Winter’s relentless agitation, and we were thankful for the support. 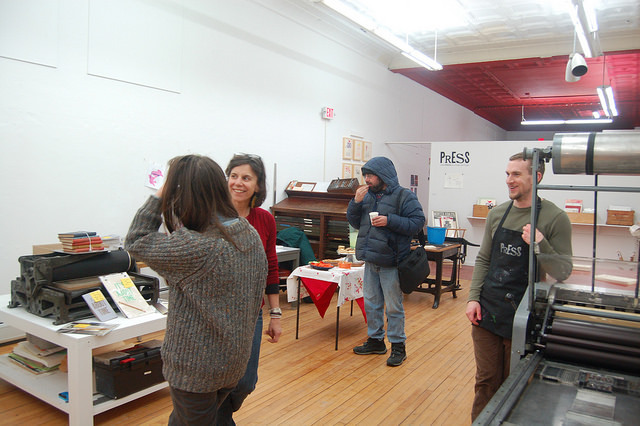 We raffled off the hot-off-the-press compilation books that were created this weekend. 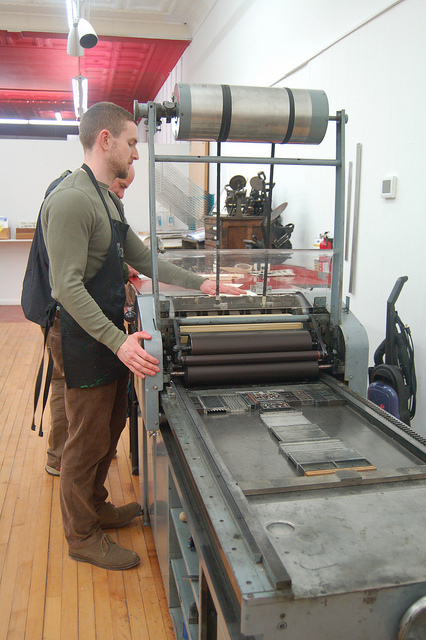 The covers were printed by ILSSA co-founder, Emily Larned, on PRESS’ Vandercook on Saturday, then Emily, Melanie, and intern Isaac joined Kate Barber at Williams College Museum of Art’s Publication Studio for a book binding party, where they hand bound 80 books in less than six hours. At the reception, we raffled off ten of these books, and everyone who bought a ticket got a prize, thankfully. Participants were looking through the workbooks, and others were filling out the blank workbooks were have available as well. 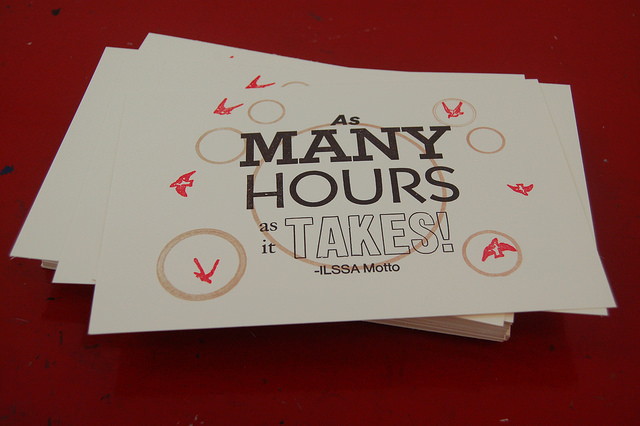 Jonas printed cards that had ILSSA’s motto on it, “As many hours as it takes!” Isaac took pictures of the event while Emily and Melanie chatted up the visitors.The opening was a success for such a wintersome night, and we have many to thank for the night. 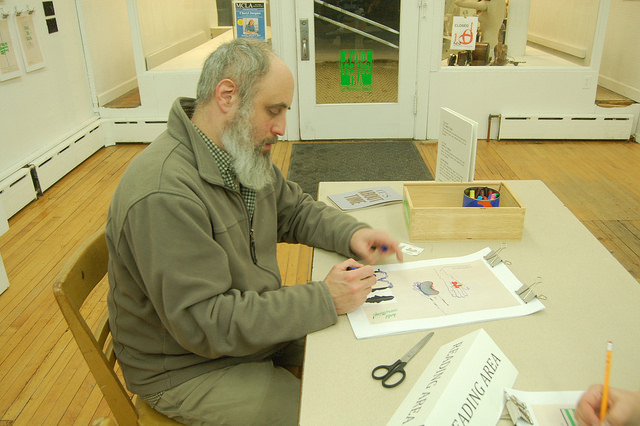 Big thanks to Emily for providing the show and coming all the way to PRESS to help make the exhibit special. To Jonas and Isaac for setting up the show. To Kate Barber, the Publication Studio, and Williams College for the collaboration. And of course, none of this would be possible without MCLA. For more photos of the event and other PRESS happenings, visit our Flickr page. 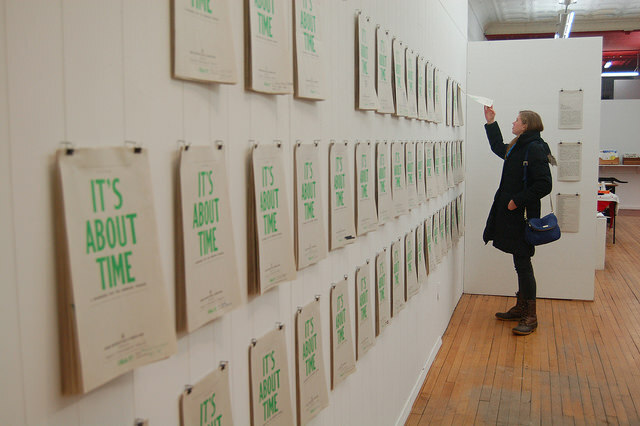 “It’s About Time” will be up until April 26th.